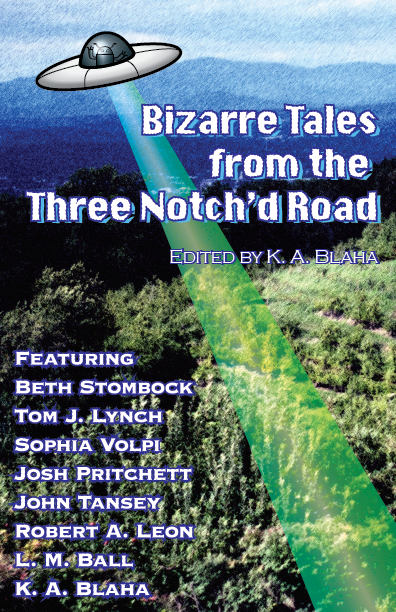 Bizarre Tales from the Three Notch’d Road is a collection of eight science fiction and fantasy stories celebrating the 5th anniversary of our SFF writing group. It’s now available for the kindle here. All the contributors are local to central Virginia, with stories from tropical islands, snowy oblivions, the distant past and the distant future. The name for this volume honors the Three Notch’d Road, which runs through central Virginia and dates back at least 300 years. So check it out! It’s the first anthology our group has produced, and we’re very excited and proud! This entry was posted in Books, science fiction and tagged anniversary, anthology, central virginia, collection, fantasy, science fiction, science fiction and fantasy, science fiction and fantasy stories, scifi, sff, short stories, three notch'd road, virginia, writerhouse on July 21, 2014 by Vironevaeh.